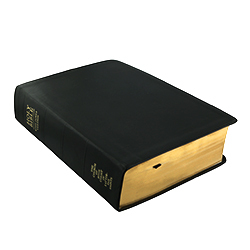 LDS Bible | King James Version Bible w/ Bible Dict & JST. Custom Embossing! 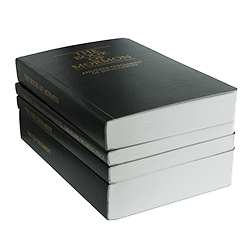 This pocket-size scripture set includes all of the standard works: Old Testament, New Testament, Book of Mormon, Doctrine and Covenants and Pearl of Great Price. Black, softcover, 3 3/8” x 5 1/8”. 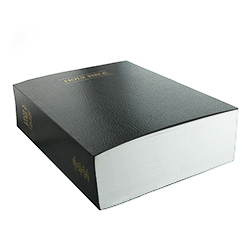 The LDS Edition of the King James Version of the Bible contains cross-references to all the standard works, a Topical Guide, a Bible Dictionary, a section of maps and pictures, and footnote references to the Joseph Smith Translation. 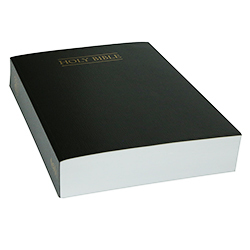 This economy edition of the Bible has a binding that is glued rather than sewn. It is not thumb-indexed. Size is approximately 8 1/2" x 11″.This size is only available in black. 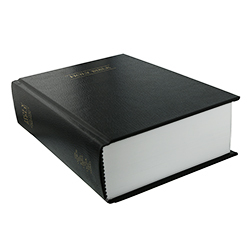 At LDS Bookstore, we carry the LDS King James Bible to help inspire and uplift individuals and families. We have the Bible in hard and soft cover editions in numerous sizes. 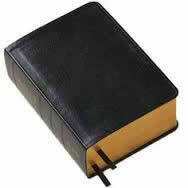 We also have Spanish versions of the Kings James Bible available.